With Nelson’s 70th birthday coming Wednesday, the eternal red-headed rascal has been inundated with tributes, including a celebrity-heavy affair in New York earlier this month that will be shown on the USA Network on May 26, Memorial Day. The phases and stages of Willie’s career have found him evolving from the honkytonk sideman to the hit Nashville songwriter, from progressive country pioneer to crooner of standards. 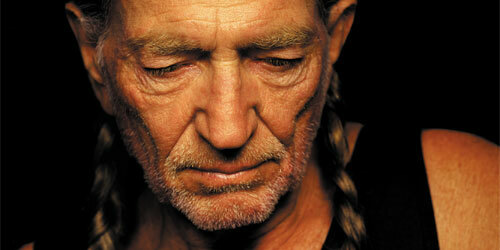 And now the iconoclast has become the icon, with Willie achieving American folk hero status. This pot-smoking Zen redneck in pigtails, who sings Gershwin through his nose and plays a guitar that looks like he picked it up at a garage sale, transcends music and has come to personify the individual, the rectangular peg to the round hole of corporatization. Bee Spears, Mickey Raphael, Bobbie Nelson: more than 140 years together with Willie. It’s a simple existence made all the more comfortable because Willie is surrounded by people who’ve been with him for decades. 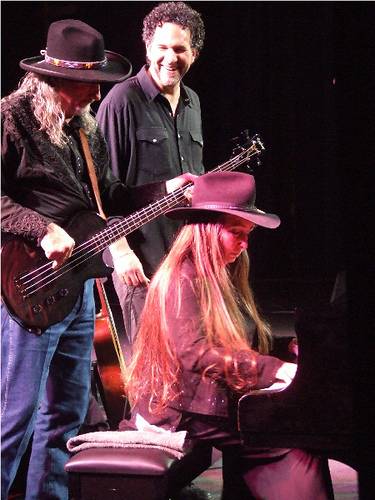 Bassist Bee Spears has lived 35 of his 53 years in Willie’s band, which also features the barrelhouse piano of Willie’s 72-year-old sister, Bobbie, and Willie’s legendary running buddy, 71-year-old Paul English, on drums. Percussionist Billy English, Paul’s brother, is the new guy, having joined just 19 years ago. Harmonica player Mickey Raphael and guitarist Jody Payne are also relative newcomers, both joining the ragtag caravan 30 years ago. “You can’t get out of this band even if you die,” Willie says with a laugh. 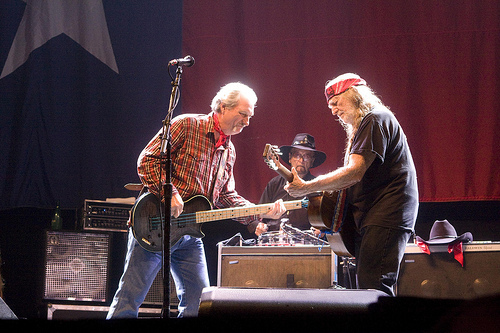 “I’ve told the guys that we’ll just have ’em stuffed and put back up on that stage.” Willie’s circle of fiercely loyal lifers include roadies (78-year-old Ben Dorcy has been with Willie since the early ’60s), sound engineers and managers. Meanwhile, his oldest daughter, Lana, travels with Willie and keeps up the willienelson.com Web site. On the road again, they just couldn’t wait to get on the road that takes them to the Lone Star Park horse racing track near Dallas on a crisp recent evening. Some of the fans come early, looking for Willie’s bus, the one that has “Honeysuckle Rose” and an American Indian figure painted on the side. A group of giddy grandmas stand outside the band’s business bus before the one with the “Ladies Love Outlaws” T-shirt gets up the courage to knock on the door. “Where’s Willie?” she asks the driver, who answers that he won’t arrive until showtime. When the women leave, Poodie says, “Willie makes every fan feel like they’re his friend. Because they are.” With piercing brown eyes that seem to have the ability to make eye contact with thousands simultaneously and a world class smile that’s both frisky and comforting, Nelson turns concerts into lovefests and makes fans feel like they grew up next door to him. Raphael says that if someone should die, the members of the Family have decided to carry on in missing man formation, as fighter pilots do after a comrade crashes. “But if anything happens to Trigger,” he says of the acoustic guitar that Willie’s picked a hole through, “that could be the show.” The Martin classical guitar, which he bought sight-unseen for $750 in 1969, is Nelson’s most precious possession. That he lets friends, about 40 so far, carve their names into the guitar says as much about Willie Nelson, the unmaterialistic scamp, as the way he plays it with gypsy fingers and a jazzman’s curiosity. Watch the movies he made here in the late ’70s and early ’80s, and you’ll see that so many old landmarks are gone, including the Armadillo World Headquarters, where Willie mapped out the common ground between hippies and the rednecks. Also torn down was the Villa Capri motel, the scene for so many guitar-picking parties hosted by Willie’s buddy Texas Coach Darrell Royal. But Willie’s still Willie, and his set starts out the same way it has since 1971. There’s the four or five guitar strums and Mickey’s snaky harp lines and then the unmistabkable nasal twang: “Whiskey river, take my mind/ Don’t let her memory torture me.” It’s a holistic hoedown as “Stay All Night (Stay a Little Longer)” follows, and then come patchwork versions of the early ’60s hits “Crazy,” “Hello Walls” and “Night Life.” Ain’t it funny how much time hasn’t seemed to slip away? There’s a scene in “Honeysuckle Rose” when Amy Irving asks Willie if he ever gets tired of being everybody’s hero. His silence makes the question rhetorical, but after watching Willie hold court on his bus a few months ago outside Gruene Hall, with person after person telling him how much his music has meant to them and their recently deceased mother, it’s a question worth re-asking. Does Willie ever get tired of being everybody’s hero? “I think when that line came up in the movie, the reason I didn’t say anything was because I was probably thinking, ‘That’s about the dumbest question I’ve ever been asked,’ ” he says with a huge Willie laugh. What a stupid question. Who wouldn’t want to be loved by millions simply by being themselves? Who wouldn’t want to be paid handsomely to do the thing they’d do for free? He’s on the road again and again, playing, in the words of Mickey Raphael, “Carnegie Hall one night and some dump in Odessa the next.” And so when Willie hits the big 7-0, it won’t be a star-studded affair at a huge Texas amphitheater, complete with fireworks. That would make too much sense. Instead, his bus, his home, is rolling towards Wednesday’s gig at the Horseshoe Casino in Bossier City, La. That’s so Willie. This entry was posted on December 10, 2011 at 4:50 pm	and is filed under Uncategorized. You can follow any responses to this entry through the RSS 2.0 feed. You can leave a response, or trackback from your own site.